In 1996 the City of Gallup turned to the Southwest Indian Foundation requesting the Foundation take possession of the historic and newly renovated Sante Fe Depot. The City asked the Foundation to turn the building into a Cultural Center. Our concept for the Cultural Center is modeled on the Public Square, where the community, school children, and visitors can gather together for forums, lectures, and celebrate the extraordinarily diverse heritages of our region. 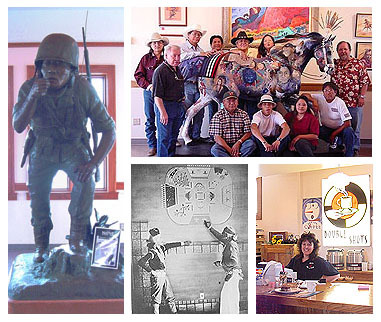 We wish to invite you to this wonderful historic building so that you too can enjoy the many exhibits we have put together - trains, weaving, sandpainting, Historic Route 66, silversmithing, and more come to life in the Storyteller Museum with in depth interviews with experts of that specific field. This project is, in many ways, a dramatic departure from the works of the Foundation (as described elsewhere in this website, the works of the Foundation can described as implementing the Corporal Works of Mercy to the Poor). 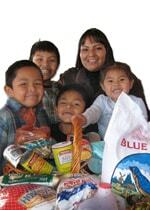 The Southwest Indian Foundation recognizes the ultimate solution to systematic poverty is economic development as well as instilling pride in the local communities. By car one can exit onto Historic Highway 66 (with separate Gallup Exits going East or West off Interstate 40). The Gallup Cultural Center is located downtown at 201 E. Highway 66, and within easy walking distance of the many shops along Cole Porter's grand old Highway. During the summer months there are Indian Dances every night at 7:00 O'clock in the outdoor pavilion just East of the Cultural Center. Stop by or call us for times and special seasonal events at 505-863-4131 or 505-863-5365.